The chef at Brooklyn's Reynard doesn't stop at food scraps. Using a 24-hour cooking schedule and encouraging her purveyors to use reusable packaging, she's pushing the envelope and showing that chefs can be powerful ambassadors. 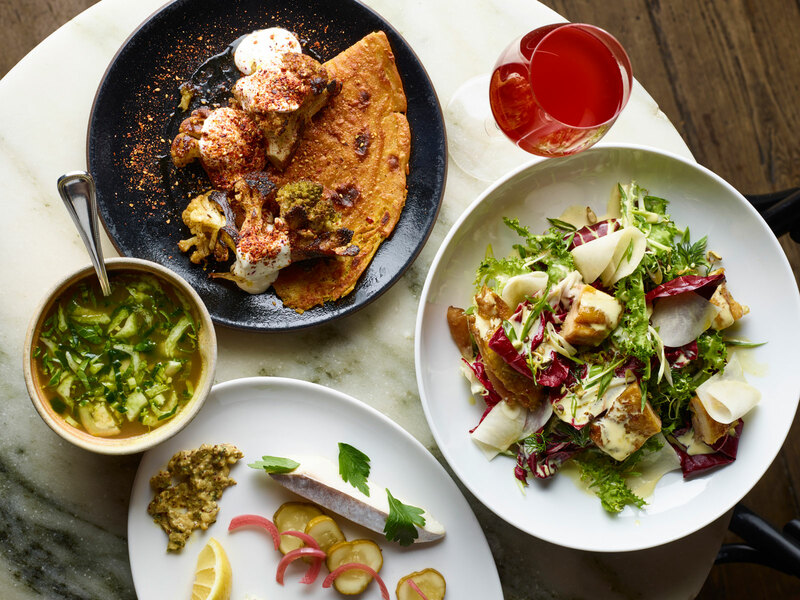 At Brooklyn’s bastion of wood-fired cooking, Reynard, chef Christina Lecki makes smokey and deeply funky borscht out of onion skins; bright and aromatic vinaigrettes flavored with dill stems; and sophisticated yogurt and granola with past-their-prime lemons. The secret ingredient to all of these dishes, of course, is food scraps. But weaving scraps into culinary gold is just the beginning for Lecki, who, since taking the reins at Reynard last year, has charged herself with making the restaurant a trailblazer in sustainability. Eco-friendly practices like local sourcing and whole-animal cooking, she points out, have become the new norms for many restaurant kitchens. That's fantastic news, but it's not enough. “You have to look at the full picture, from when you get products in, to when they are served,” she says. Restaurants, she says, have a unique responsibility toward the environment: “Restaurants are extremely exciting places to work, but they are also some of the most wasteful.” In fact, according to Drawdown, an organization devoted to building solutions for climate change, food is one of the top perpetrators of greenhouse gas emissions. Her first step has been working toward making the kitchen at Reynard zero waste. That means filling boxes with those onions skins, which will eventually be dehydrated, smoked, ground into a powder, and used to punch up stocks. “It’s an ingredient that tricks you into thinking a soup is meaty, because it’s rich and intense,” Lecki explains. Anytime she juices a fruit or a vegetable, she’ll save the pulp — a byproduct that can emit a lot of carbon dioxide if tossed — and use it to fortify the flavors in, say, the apple vinaigrette for her hearty salad of smoked cabbage, roasted apples, and spiced pecans. Leftover whey from yogurt becomes the tangy base for a silky and aromatic garlic soup. And the secret to the impossibly smoky beets she serves alongside radishes and crispy shallots? Ash. It’s a technique she learned from famed chef Sean Brock, which involves saving the leftover ash from the wood-fired oven, mixing it with water, and using that blend as a clay coating for roasted vegetables. She says this enhances that earthy, charred flavor from the oven, and puts to use the ash she would otherwise throw out. Lecki also developed a proprietary 24-hour cooking schedule, after realizing that at the end of the night, the oven was still quite hot, but that energy was going to waste. She’ll throw some squash into the oven after service, and let it slowly roast overnight as the temperature dies down. In the morning, she’ll scoop out the sweet, creamy flesh, along with the seeds, and serve them alongside whipped butter. 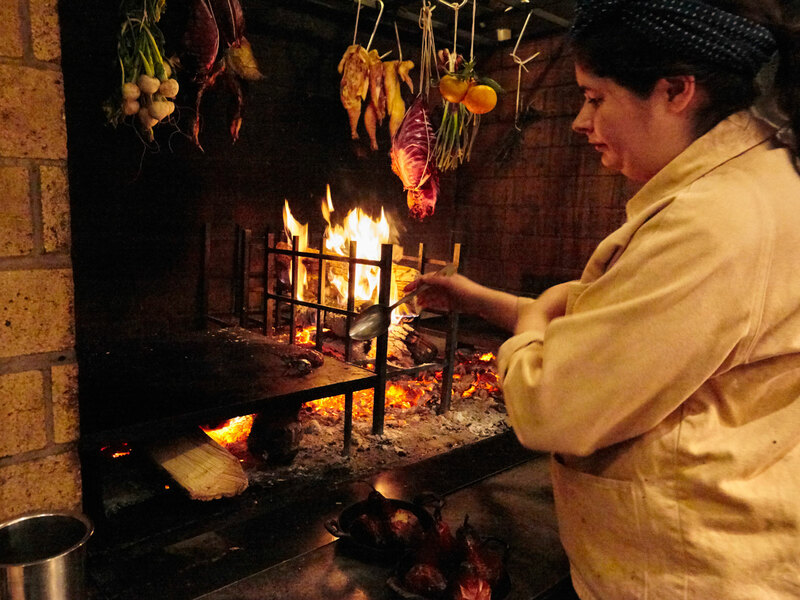 “Instead of letting the fire die down and then starting a new fire the next day with fresh food,” she says, “we are taking advantage of energy that’s already there.” To her knowledge, she’s the only chef who has adopted this method, but she’s hopeful that anyone with a wood oven might do the same. The next hurdle will be an area that could prove to be an uphill battle: packaging. She noticed that when she receives produce, the boxes that are used to transport the goods get immediately discarded by restaurants. “There is no purpose for it except to get something from point A to point B,” she says. She’s pushing to have all her produce delivered in reusable containers that she can return to the purveyor once she and her team are done unpacking. She’s also looking into the possibilities of getting items delivered in bulk packaging — like alcohol, for example, which typically comes in tons of small glass bottles. Lecki is not the only chef who has gone above and beyond to answer the call for sustainability. Preston Miller, the chef of Les Grandes Verres, the famed Paris restaurant inside Le Palais de Tokyo, recently convinced his purveyors to adopt reusable containers and 100-liter bottles for alcohol. He estimates that he is eliminating 70,000 bottles worth of waste every single year. He also utilizes the classic French format of the “Plat du Jour” (daily special) to use up leftover food scraps — cauliflower leaves get fermented and turned into cauliflower kimchi; carrot pulp becomes carrot puree, or a savory carrot pastry. There’s an on-site garden where Miller grows all the restaurant’s herbs and flowers, and bees pollinate the flowers to produce honey as well. The Perennial in San Francisco, overseen by husband-and-wife team Karen Leibowitz and Anthony Myint, is a restaurant whose entire premise is predicated on regenerative agriculture — which means producing food that is actively good for the planet. Leibowitz and Myint buy their meat from carbon ranches, and make their bread using the grain, krenza — both carbon ranches and growing krenza work to sequester atmospheric carbon dioxide through soil. All their electricity comes from renewable sources, and they have consolidated their refrigeration to preserve energy. Chloe Vichot of Ancolie in New York is tackling lunchtime waste: most all the food served in her restaurant comes in reusable glass jars, which guests can exchange for a dollar of store credit (she currently has a 30 percent return rate). She donates all her food scraps to a community garden, so that she knows exactly where her waste is ending up. The biggest challenge comes with balancing sustainability initiatives, which often cost more money, with the already razor-thin financial margins of running a restaurant. But Vichot says that there are creative ways around this. For example, she keeps apple peels and turns them into apple chips, which are sold at the restaurant. Those chips end up paying for her composting system. And, because the amount of trash she produces is so small, she only has to pay for a collector to come three times a week. And, Lecki adds, while these changes may cost more up front, as they gradually help to conserve resources, time, and energy, they may end up saving money in the long term.